"To do Poussin again from nature and to make of Impressionism something solid and durable, like the art of the museums," such was Cezanne's ambition. In Three Bathers, bathers participate in the most secret movements of creation. As Maurice Merleau-Ponty explained, "Cezanne wanted to paint this primordial world and that is why his pictures create the impression of nature at its origin." Fernand Leger stated, "Without Cezanne, I often wonder what present-day painting would be. For a long period I worked with his oeuvre. It never left me. Of my exploring and discovering it there is no end. Cezanne taught me to love forms and volumes and he made me concentrate on drawing. I had a presentiment then that this drawing should be rigid and not at all sentimental." 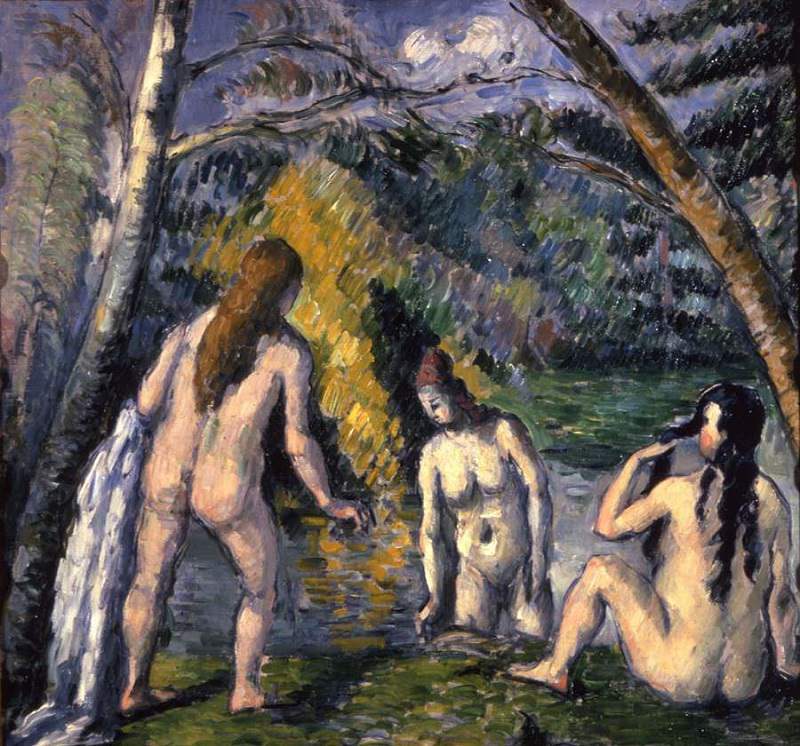 Cezanne was intimidated by women, as is evident in his youthful works. "I paint still life." he told Pierre-Auguste Renoir. "Female models frighten me. The hussies are always in the act of observing you so as to seize the moment when you are offguard. One must be constantly on the defensive and the subject disappears." In 1890 the Paris art dealer Julien Tanguy sold his Cezannes at a fixed price - 100 francs for the large canvases and forty for the small ones.